Serena Williams was fined $17,000 for three code of conduct violations after she lashed out at the chair umpire during the 2018 U.S. Open women’s championship on Saturday. 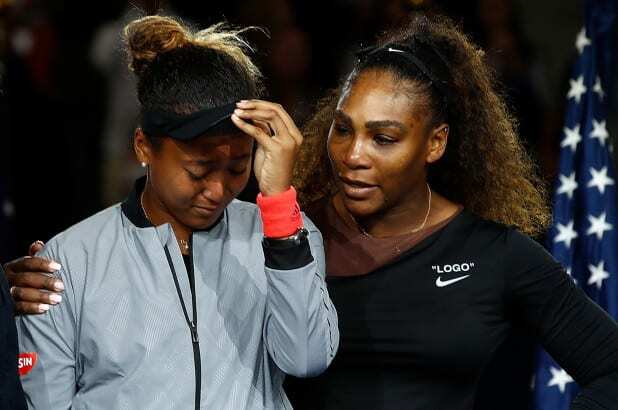 Japan’s Naomi Osaka, 20, beat Williams in straight sets to become the first Japanese and Haitian tennis player to win a Grand Slam title. Williams was fined $10,000 for calling chair umpire Carlos Ramos a “liar” and a “thief.” She was also hit with a $4,000 fine for violating the no coaching rule and a $3,000 fine for breaking her tennis racket on the court. On the 45th anniversary of Margaret Court winning her 24th and final major, Williams was favoured to move alongside the Australian in the history books but imploded in the second set – surrendering a whole game when she called the chair umpire, Carlos Ramos, “a thief” – as 20-year-old Osaka held her nerve to win 6-2, 6-4, the first ever Japanese winner of a grand slam title. “I don’t cheat to win, I’d rather lose,” Williams told Ramos. Ramos took a point away from Williams when she broke her tennis racket after missing a backhand shot into the net, which allowed Osaka to get back on serve at 3-2 in the 2nd set. “You stole a point from me! You’re a thief too!” Williams yelled at Ramos, who took away a game from Williams. Williams went on to lose the 2nd set 6-4. The money came out of Williams’ runner-up check of $1.85 million. Osaka took home $3.85 million in championship prize money. Most tennis fans agreed that Williams would have lost the match regardless of the violations. Osaka was just too powerful. But Williams accused the chair umpire of penalizing her because she is a woman. The men’s champion Novak Djokovic disagreed that women are treated differently. Serena Williams and Carlos Ramos, the umpire whom she accused of sexism in the wake of the US Open final last Saturday, are likely to be kept apart at the Australian Open. Rafael Nadal ends year as World Number One; The oldest to finish the year at the Top, aged 31.